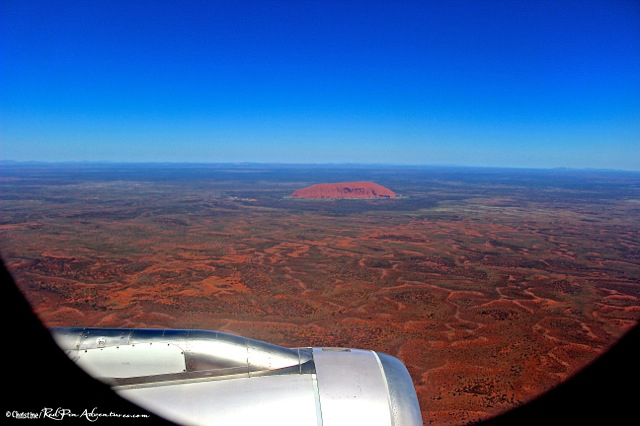 It was so exciting to see our first view of Ayers Rock from the window of the plane as we were flying from Sydney to the Ayers Rock airport. This is another stunning view of Ayers Rock from the plane. 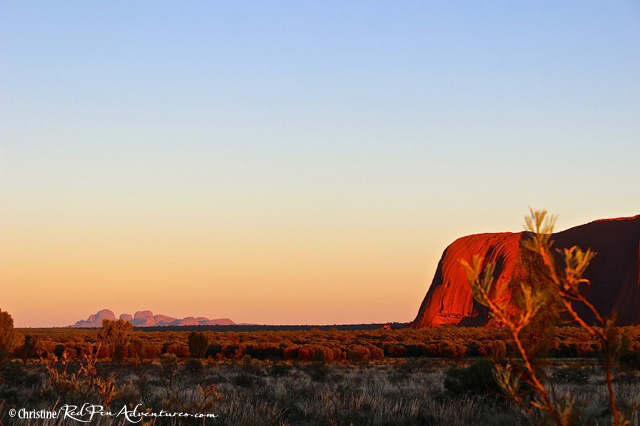 I remember thinking that it looked so surreal seeing this big red rock sticking up out of the earth all by itself! 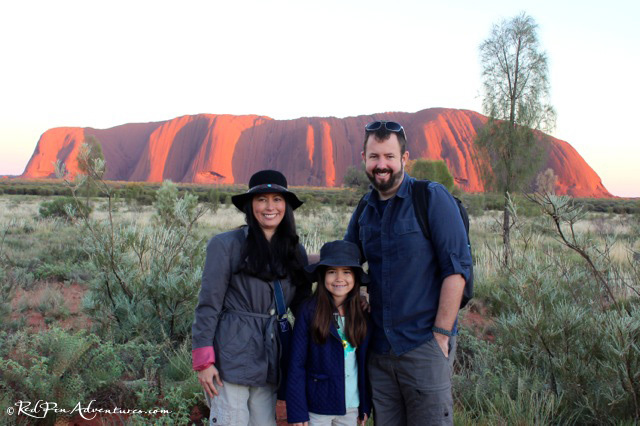 We had to start our first morning at Uluru way too early for the sunrise and guided base walk tour we booked through AAT Kings! Anyone who knows me well knows that I am a night owl and not an early bird!! I promise you that it was all worth it in the end though! 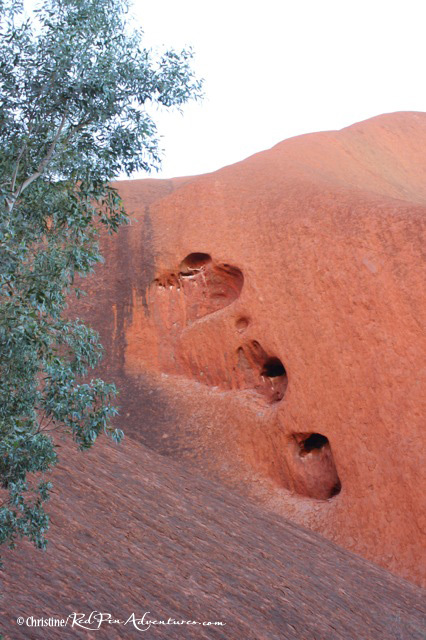 This is one of my favorite shots from our visit to Uluru. It was so peaceful watching the changing shadows and lights displayed on this massive rock while the sun rose right in front of our eyes! Truly a must see once in your lifetime! 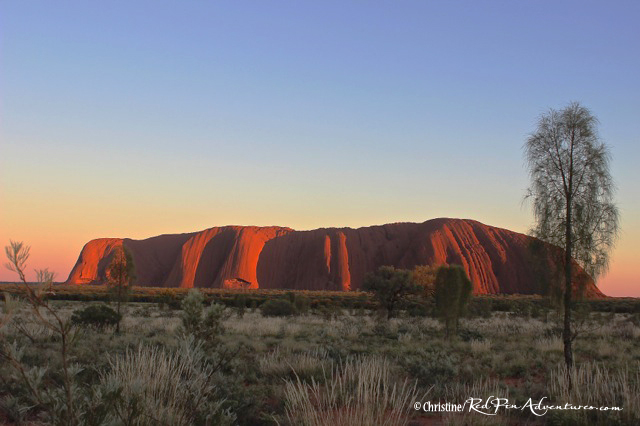 This shot is a view of the left side of Ayers Rock with a view of Kata Tjuta in the background during the sunrise. 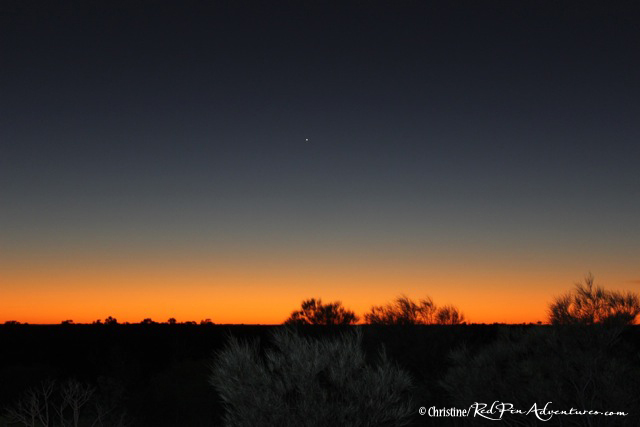 It is surprising how small Kata Tjuta looks in this image! After the sunrise, we walked down from the viewing platform to the closer viewing area on the ground and had a nice lady take this photo of us. 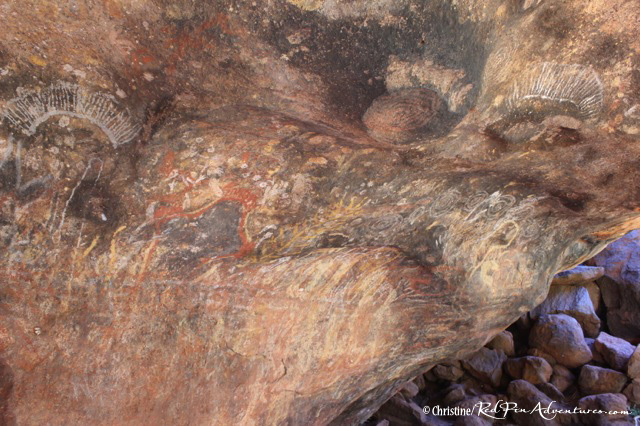 This shot is of some of the Aboriginal rock art we saw during the Mala Walk. It was pretty exciting to see it in person! There were several black spots on the top of the cave which was probably from the fires they had burning on the ground. It was pretty exciting to see this art work in person! 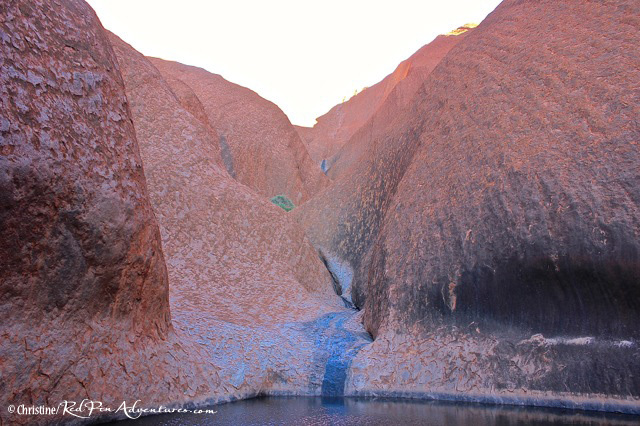 This was the stunning watering hole at Kantju Gorge. The heart was also to the right of this view. 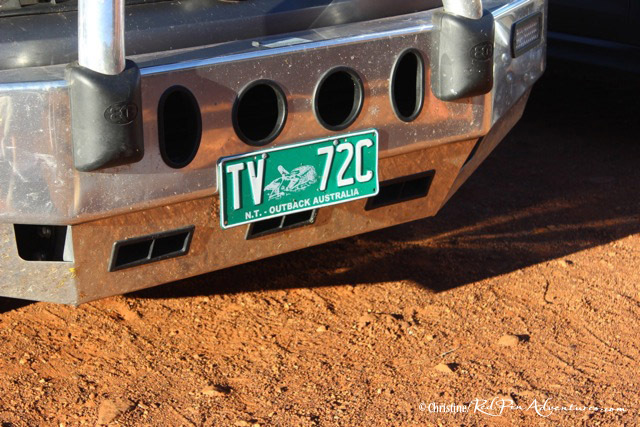 This was a license plate of one of the tour vehicles while we stayed in the Outback. 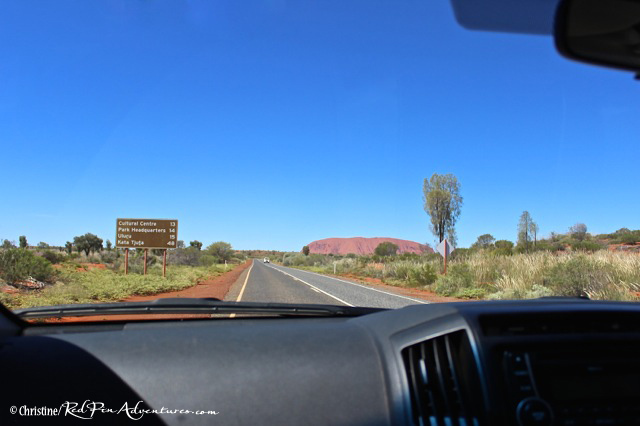 We decided to rent our own car for the drive over to see Kata Tjuta (the Olgas). 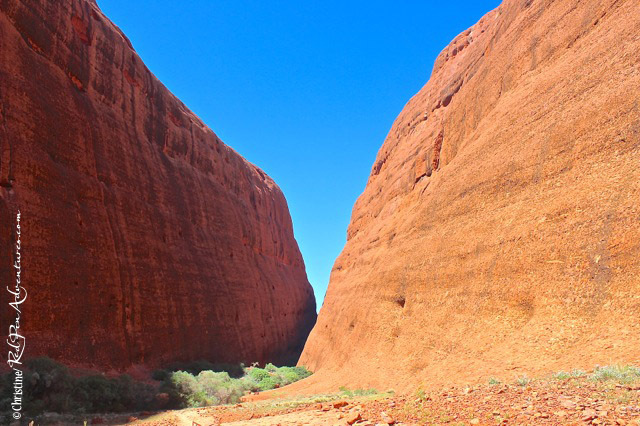 There are 36 domes which form Kata Tjuta. 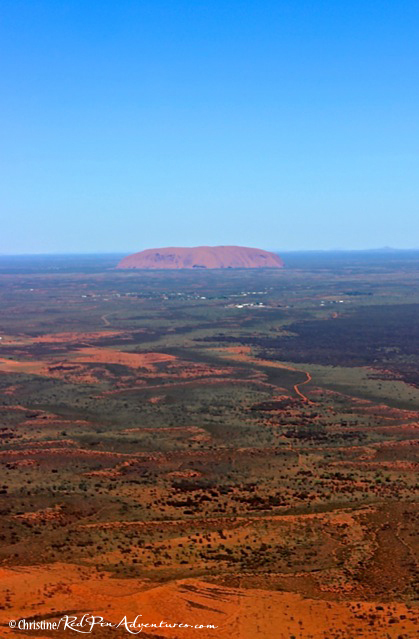 Mount Olga is actually some 200 meters taller than Uluru! 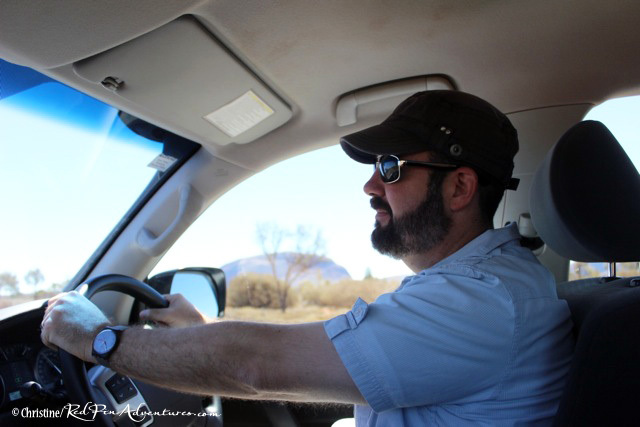 We were a little nervous at first as my husband would have to drive on the other side of the road for the first time. Last summer, we hit a tree trying to park the RV we rented in Florida and that cost us $1000 in damages! Yikes!! It was a pretty quick drive over, so luckily all ended up being fine this time. It was a very hot day and the flies were a bit much, (tip: definitely buy one of those silly nets that cover your head… we really wished we had) but we still managed to have a nice hike! 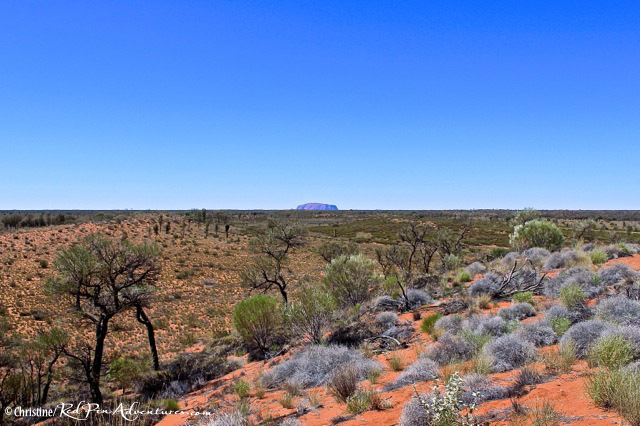 This is a shot of Ayers Rock from our rental car during the beginning of our ride over to Kata Kjuta! 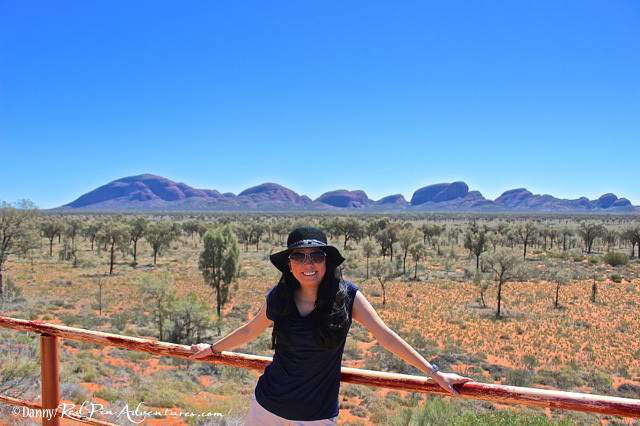 This is a shot of me at the viewing platform for Kata Tjuta. It was a beautiful sight and much different from Uluru! This is how small Ayers Rock looks from the Kata Tjuta Viewing Platform. 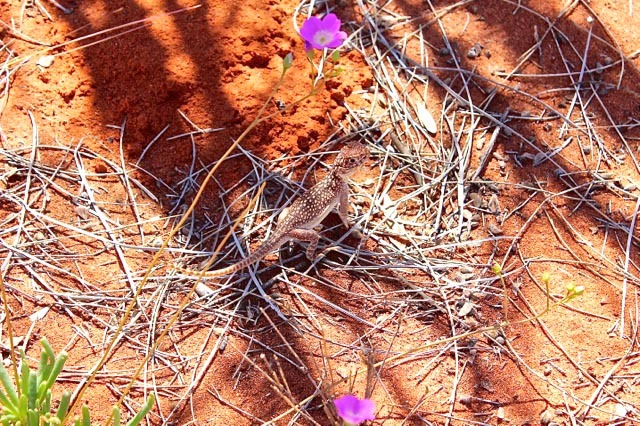 This was some type of lizard we spotted while walking up to the Kata Kjuta viewing platform. 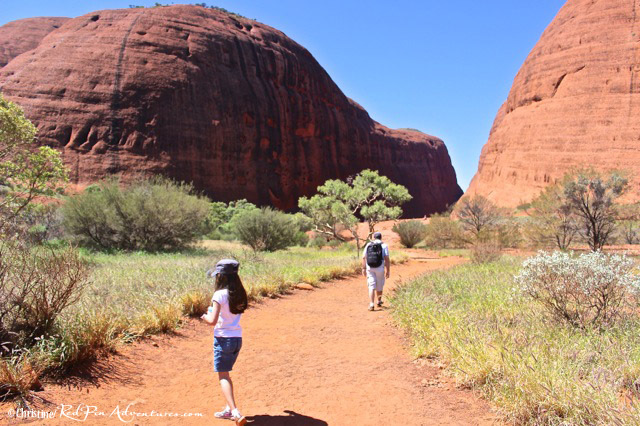 This was towards the beginning of the hike up to Kata Kjuta. 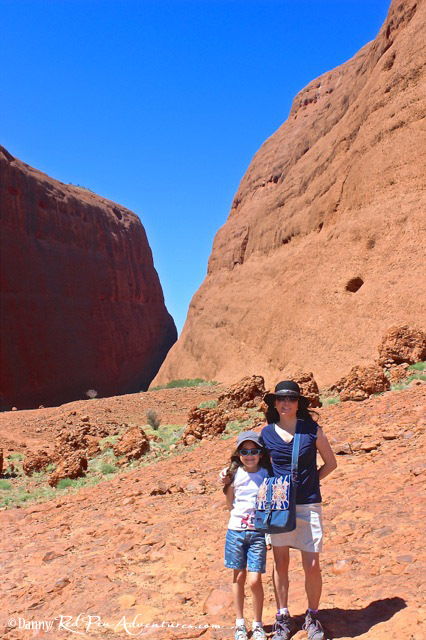 Mia and I at a stop along the hike up at Kata Kjuta. We definitely had to stop a couple of times because of the heat for some water! A close up shot of these massive rock formations. Photos can never do it justice. You really need to see them in person to truly experience the awe of these stunning formations! Danny having to drive on the other side of the road and on the right side of the vehicle for the fist time! It was pretty strange, but he did great!! 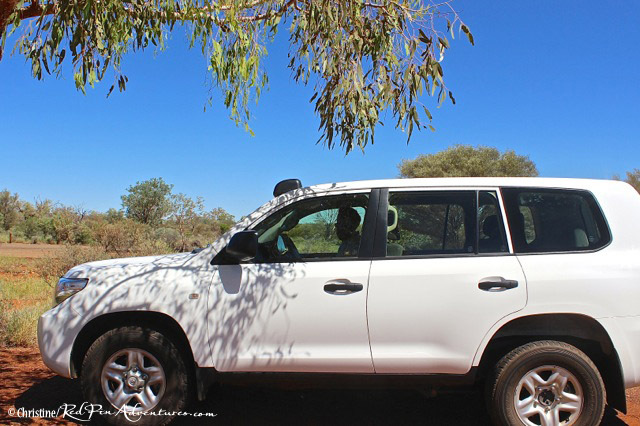 This was the 4×4 we rented for the trip to Kata Tjuta! It was a fun experience for us! 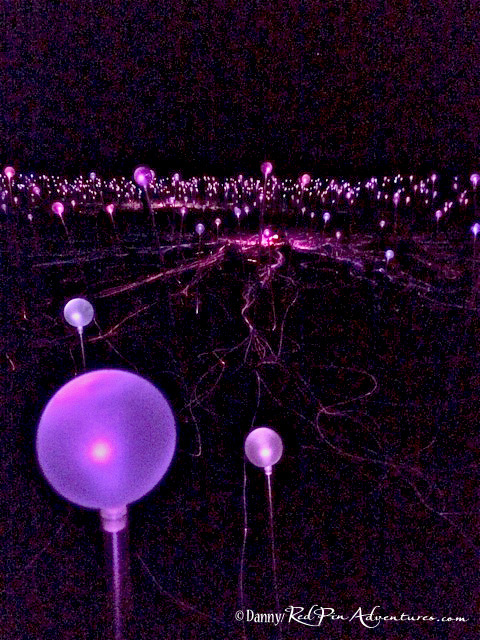 The highlight of our trip was definitely the opening night of Field of Light by Bruce Munro. 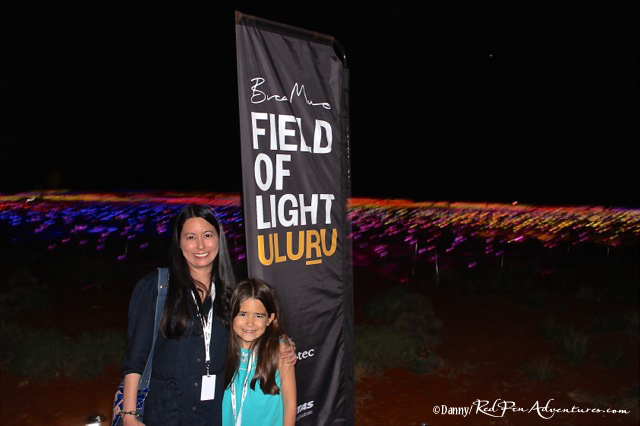 We purchased tickets well in advance for the Sounds of Silence event which included a dinner under the stars overlooking the stunning Uluru-Kata Tjuta National Park with access to the Field of Light art installation after the yummy 3-course bush tucker inspired buffet. 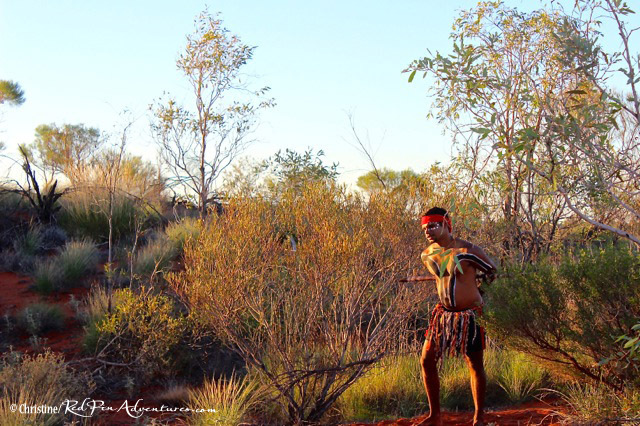 The experience even began with canapés, Australian wine and beer along with local dancers and a funky sounding didgeridoo being played! What an experience we will never forget and what a surprise to get to actually meet the artist, Bruce Munro as he was at the dinner along with his family for the opening night! A local dance performance at the beginning of the Sounds of Silence event. We were able to experience a really cool local performance at the Sounds of Silence opening night! 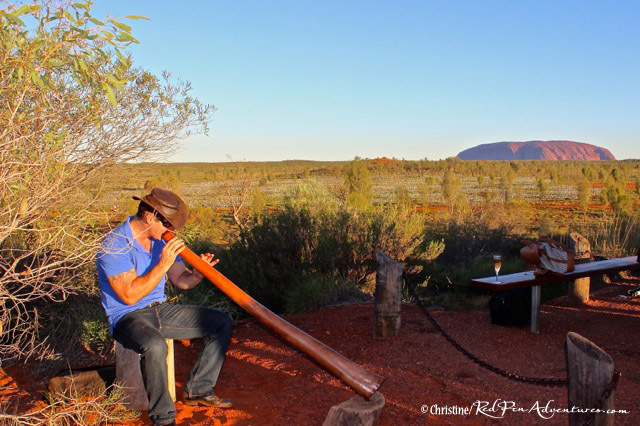 It was pretty amazing to enjoy a glass of wine and hear the funky sounds coming from this didgeridoo while looking at Ayers Rock in the background. 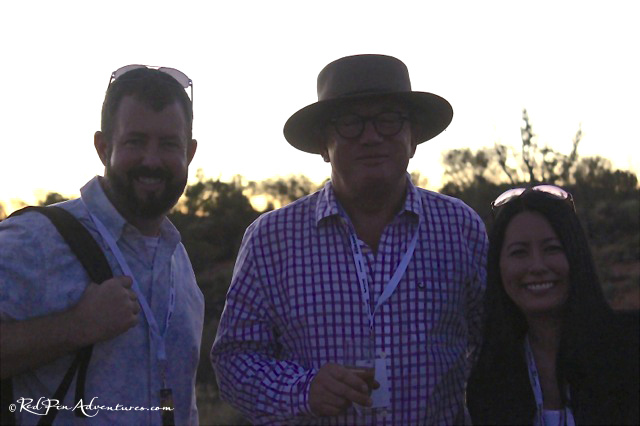 What a truly unique Australian Outback experience it was for us! 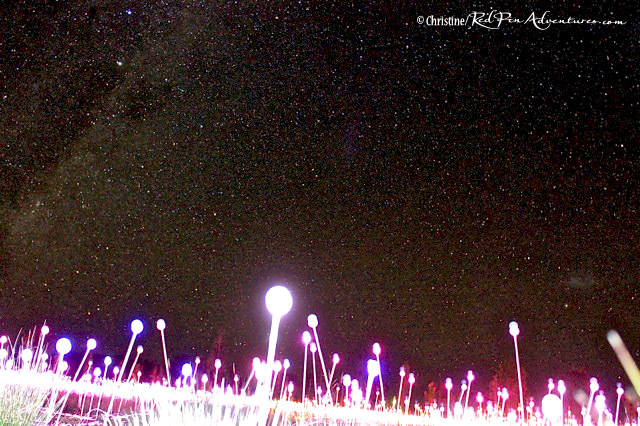 Danny and I with Bruce Munro, the internationally – acclaimed artist behind the Field of Light installation. We enjoyed chatting with him for a bit on the walk to the dinner area and hope to get the chance to see another one of his installations in the future. A big thank you to Mary from for taking this photo for us. She was a very sweet lady from Brussels who sat with us at dinner. 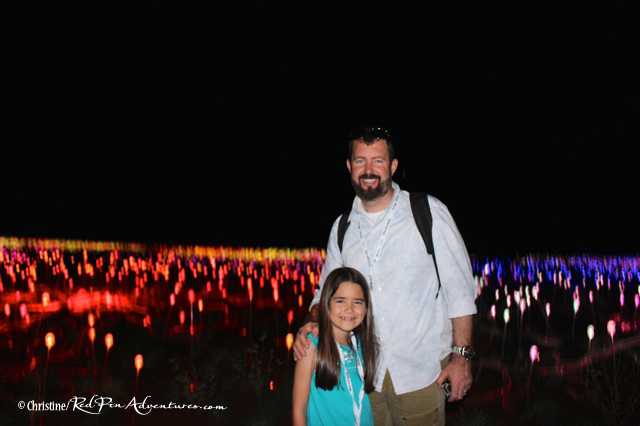 Mia and I at the entrance into the stunning Field of Light installation. The Field of Light installation has over 50,000 frosted-glass spheres on display until March 31, 2017! It is definitely a once-in-a-lifetime experience to see if you can! My family and I really enjoyed the experience of getting to stroll through the winding pathways of the Field of Light Installation. There was something truly inspiring while walking amongst the thousands of lights and under the milky way in the Outback night sky. Danny and Mia in front of the Field of Light display. I think we all could have happily spent all evening strolling through the display! I wish we could have just laid down on the ground and spent the whole night there in the middle of the lights under the stars! 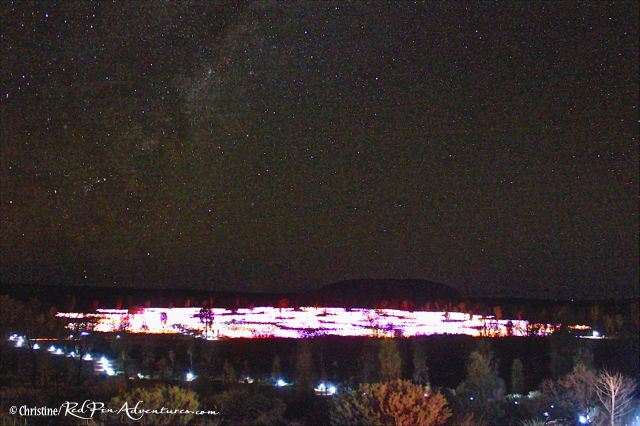 The surreal sight we saw of the Field of Light display in front of Ayers Rock at the end of our walk through the display. It will literally give you chills and is an out of this world feeling to see it in person. We truly felt that we were on another planet and I really tried to soak the sight all in for as long as I could! 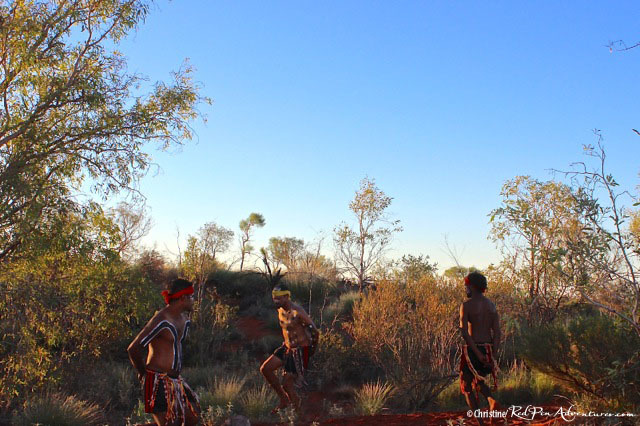 We will never forget this truly amazing experience and will be forever grateful to have had the opportunity to finally make it to the Outback of Australia! 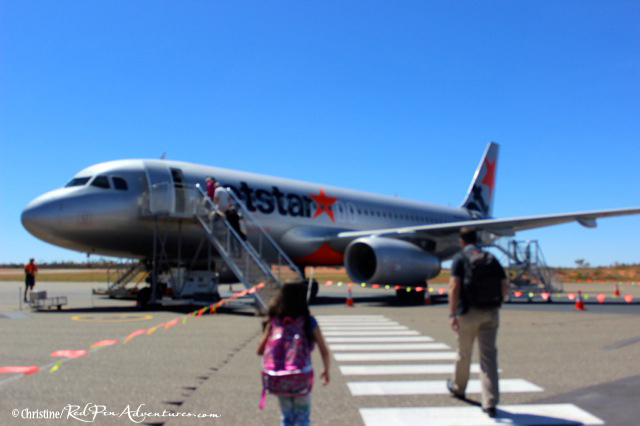 The end of our adventure to the Outback of Australia. This was one of the smallest airports we have ever had to land at. The plane had to use the same runway we landed on to turn around on to get to the gate! I have wanted to visit The Land Down Under since I was a little girl. 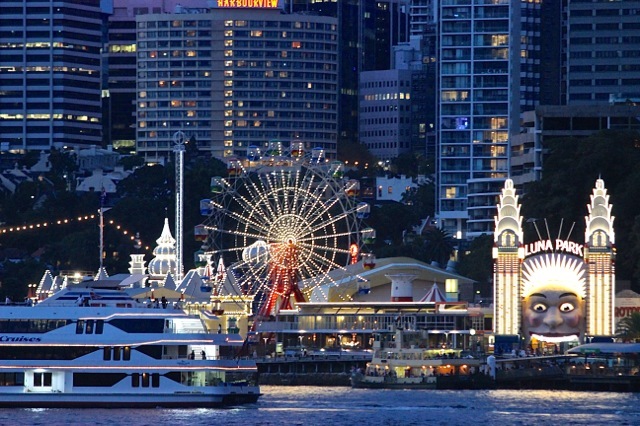 Who isn’t curious about this country with such amazing things as cute koalas, kangaroos, surreal Uluru/Ayers Rock & the stunning Sydney Opera House? 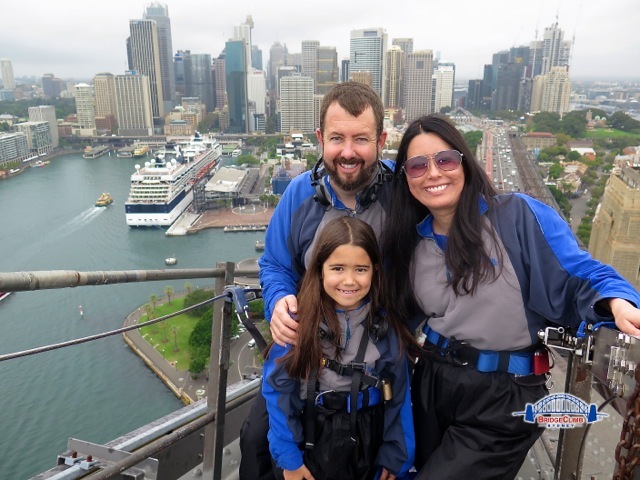 My family and I have finally crossed off Australia from the top spot on our travel bucket list and we had an amazing adventure exploring the Outback, Sydney and the Blue Mountains areas. 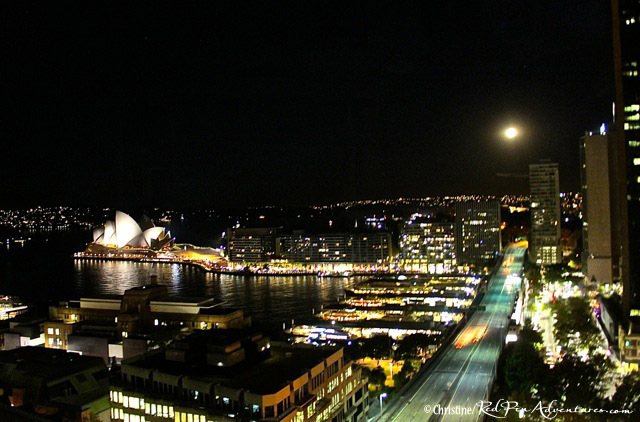 We arrived at Sydney in the evening and this was our fist view of the Sydney Opera House from our room at the Shangri-La. 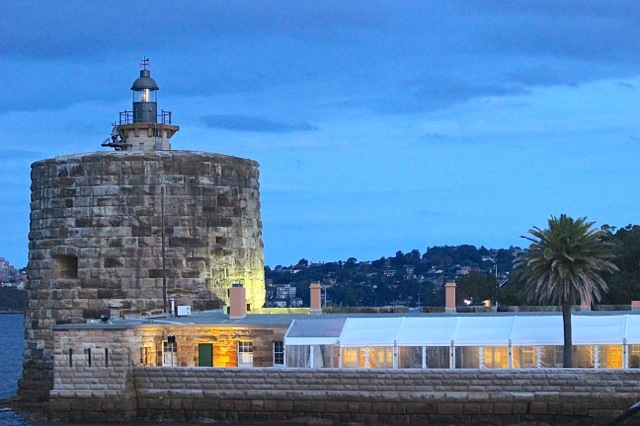 The online reviews were spot on about how amazing the view was from the Premier Grand Harbour View rooms and the staff were extremely friendly as well! 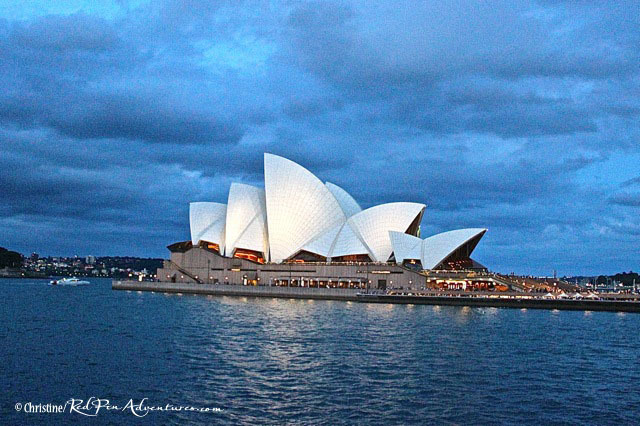 It was raining and cloudy pretty much all week, but the Sydney Opera House still shined and is one the most stunning architectural masterpieces we have ever seen! One of the many Mine! Mine! 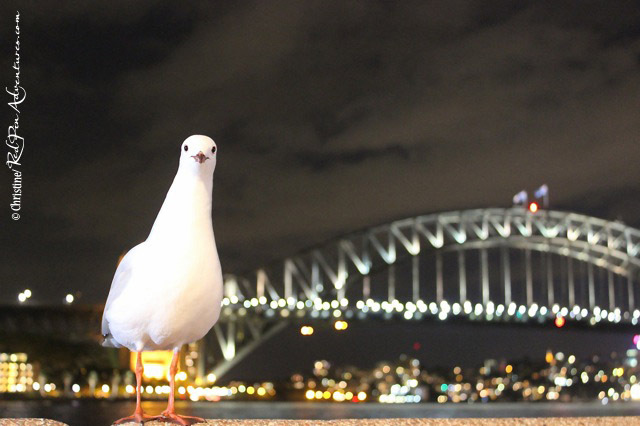 birds who enjoyed hanging out with us over dinner overlooking the beautiful Sydney Harbour. This was on our ferry ride from Circular Quay over to Manly Beach. An evening shot of the entrance to Luna Park. The distinct smiling face is one you’re sure to never forget! 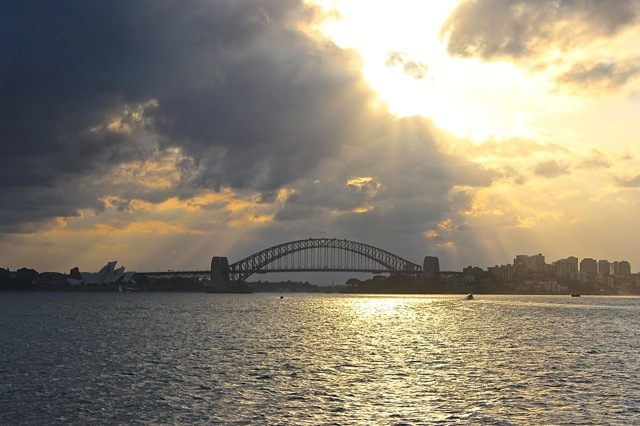 The sun beginning to set over the Sydney Harbour Bridge while on our ferry ride over to Manly Beach. This is Mia and I on Easter Sunday on our walk to the Sydney Opera House to go on the tour for the first time! 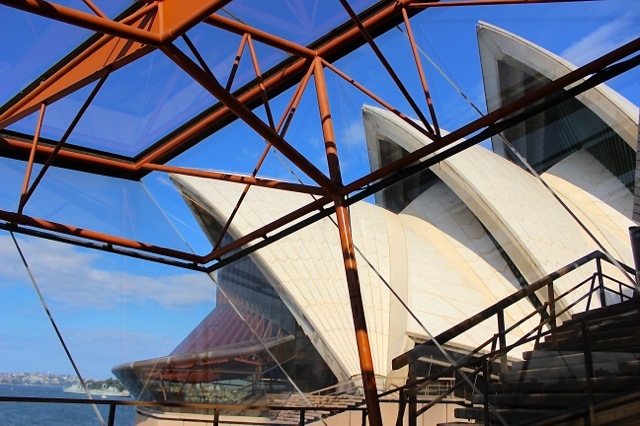 This is a view from inside the Sydney Opera House glass curtain walls of one of the eastern shells with a view of the western shells. 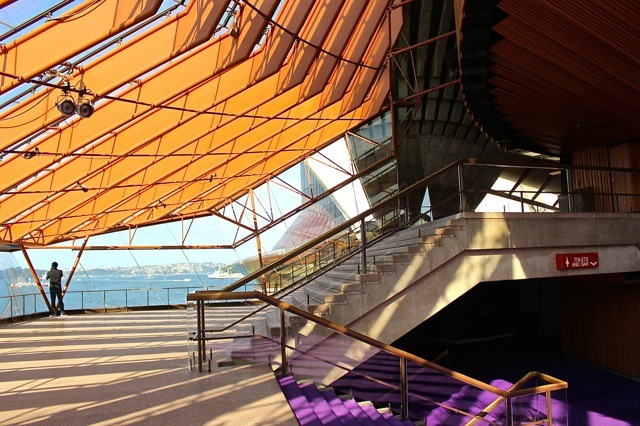 A view of the Northern Foyer inside the Sydney Opera House with its distinctive purple carpet. 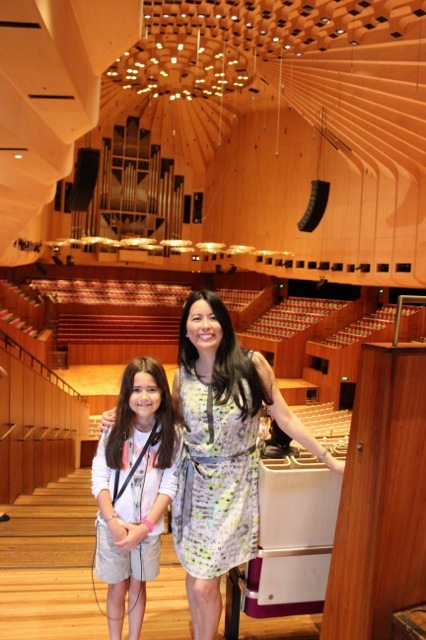 Mia and I enjoyed seeing the beautiful Concert Hall at the Sydney Opera House. The stunning Concert Hall. 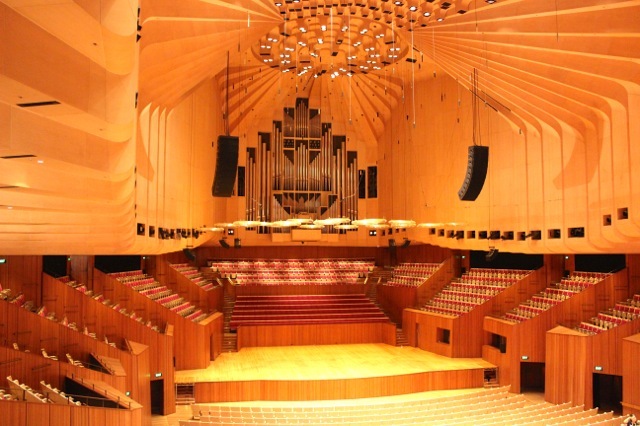 This was the most majestic space we saw inside the Sydney Opera House. 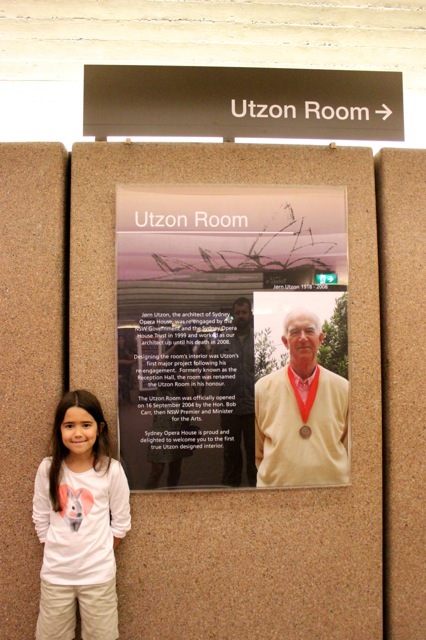 Our future architect in front of the sign honoring the Danish Architect, Jørn Utzon who designed the Sydney Opera House. We were shocked to hear that he never actually had the chance to see it completed in his lifetime! 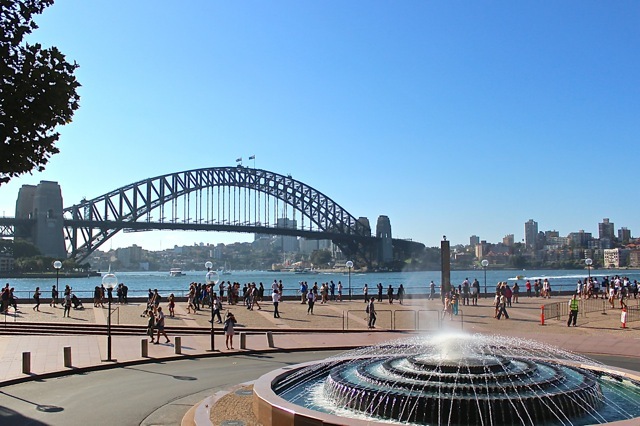 A view of the Sydney Harbour Bridge from the fountain in front of the Sydney Opera House. 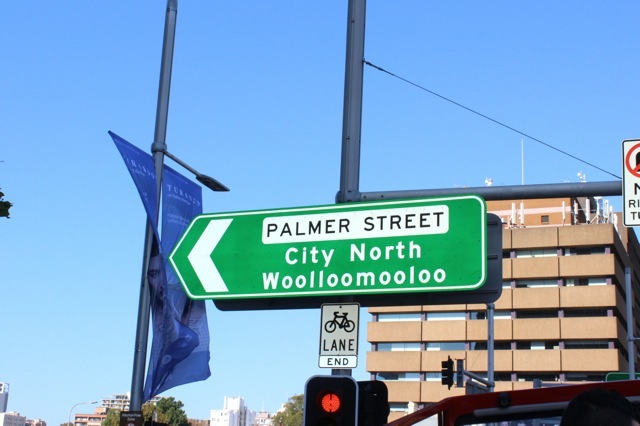 We loved the name of this city on this directional sign! 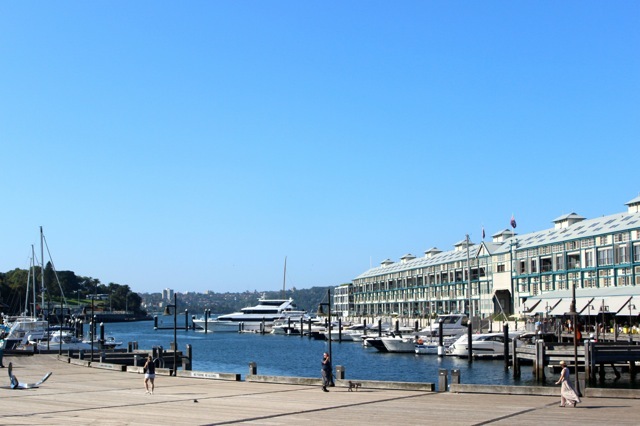 A beautiful view on our tour around Sydney from the hop-on, hop-off bus. 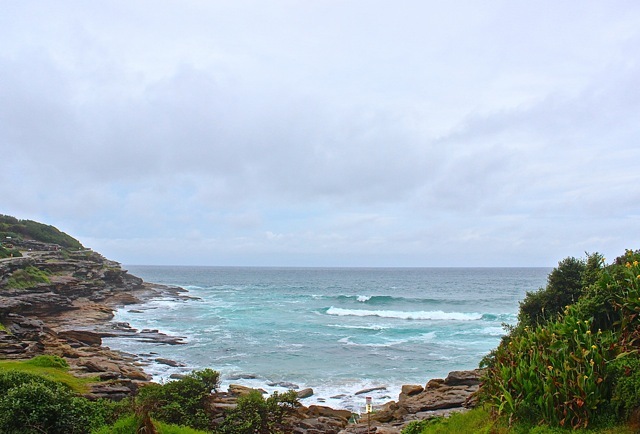 It was another gloomy day, but we really wanted to see Bondi Beach on our last afternoon in Sydney! 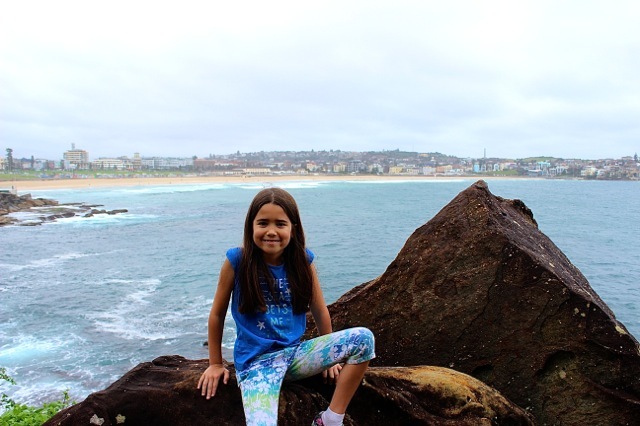 Mia at the stunning Bondi Beach. 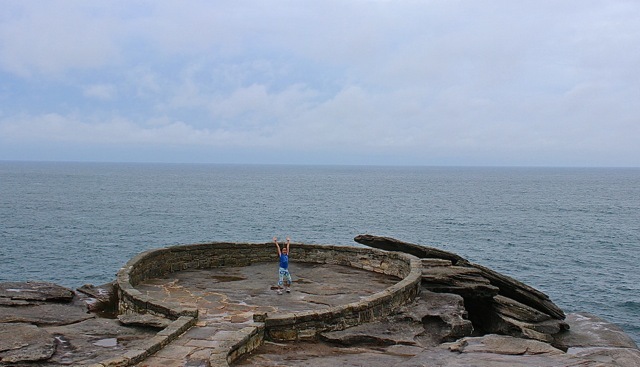 Mia loved this cool circular stone walkway which felt like the edge of the earth on the coastal walk. 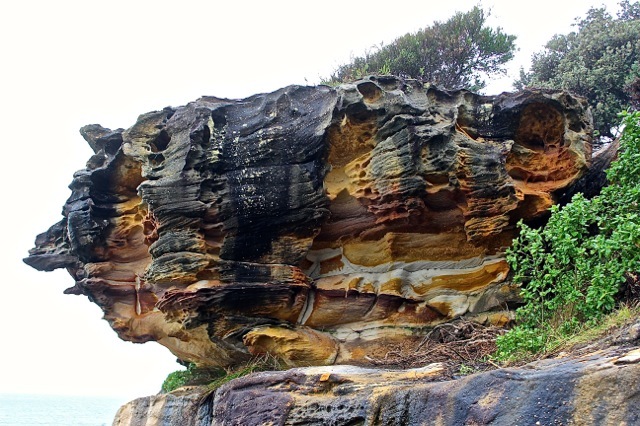 There were many of these cool rock formations along the coastal walk. A beautiful view of the waves coming in on the coastal walk. 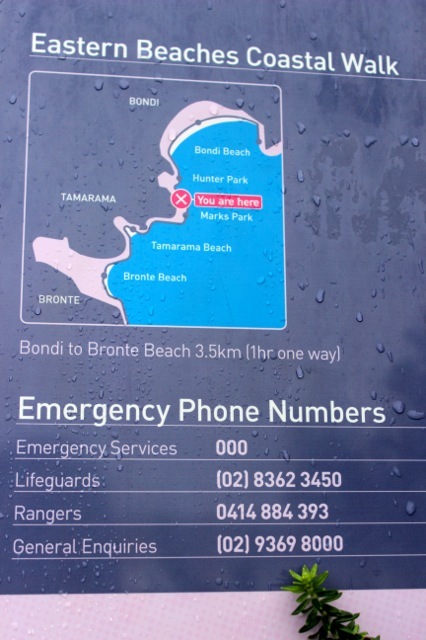 A map of the Eastern Beaches Coastal Walk. 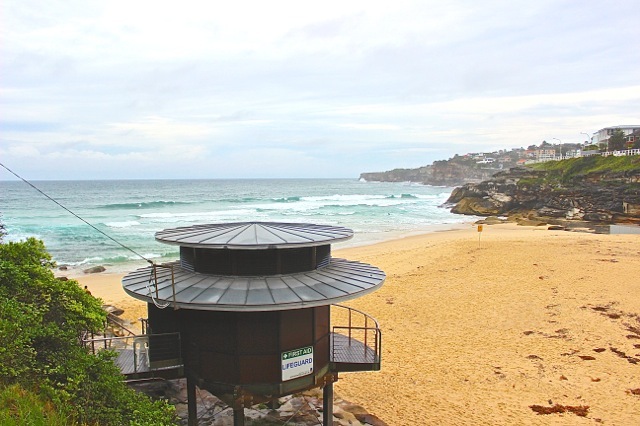 A lifeguard stand at the end of our coastal walk. We were running out of daylight, so we decided to take a bus back to the city after this stop. 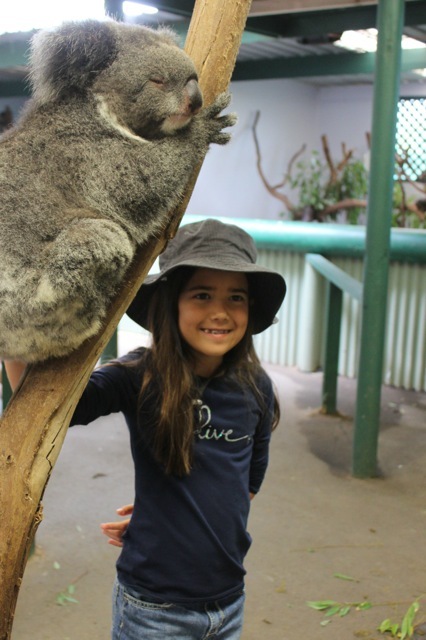 We really enjoyed meeting the adorable koala bears at the Featherdale Wildlife Park in Sydney. 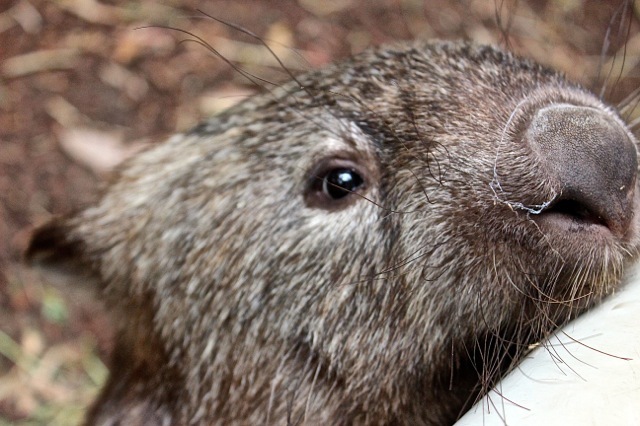 A funny wombat we fell in love with! It looks like he got his nose in a spider web! 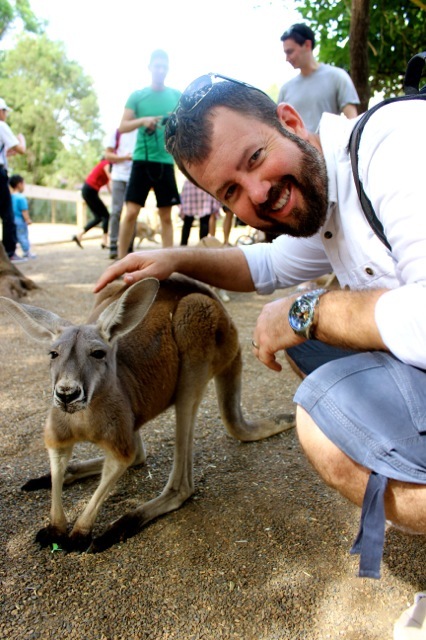 Danny with one of the friendly kangaroos at the park. 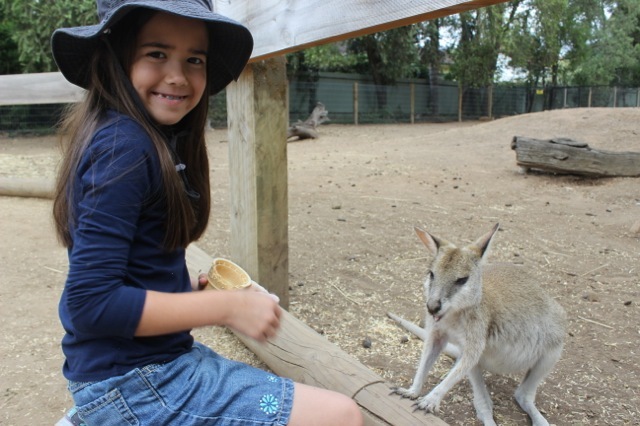 Mia had a great time hanging out with all of the kangaroos at the back of the park! 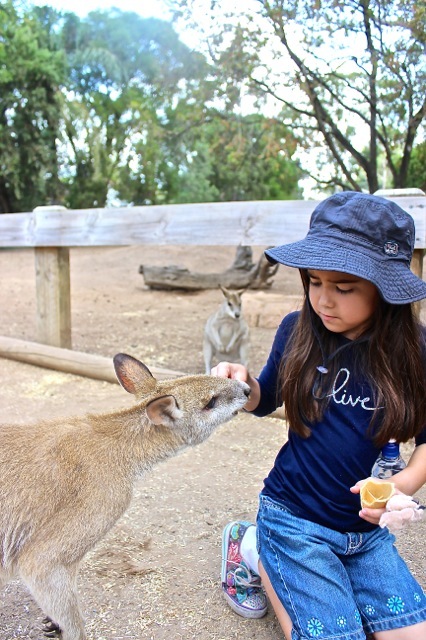 Mia feeding one of the kangaroos an ice cream cone! 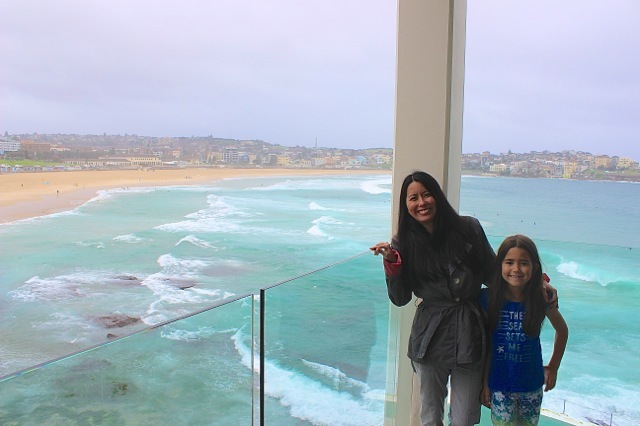 This experience was her favorite part of our stay in Sydney. 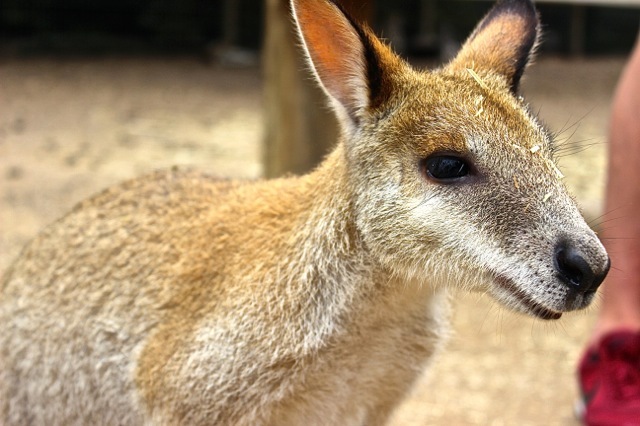 A close-up of one of the beautiful kangaroos at the park. 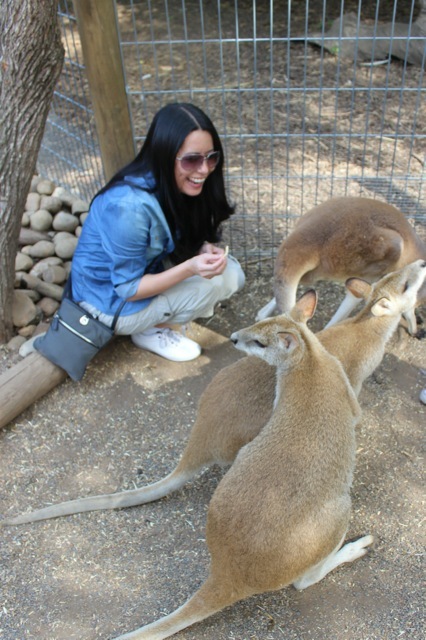 The kangaroos were pretty funny and we really enjoyed the time we had with them at this amazing park! 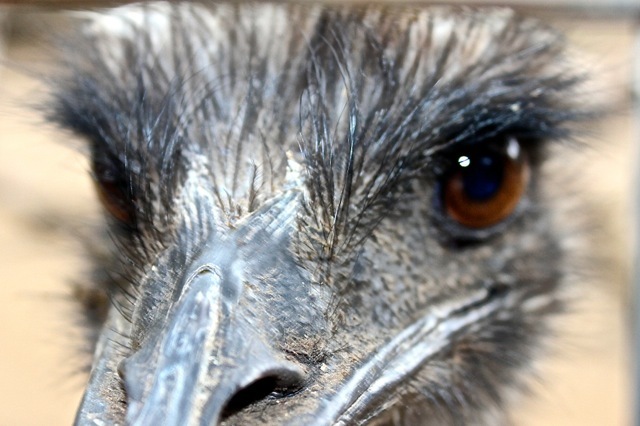 A really close-up shot of a stunning ostrich who wanted to check out my camera! 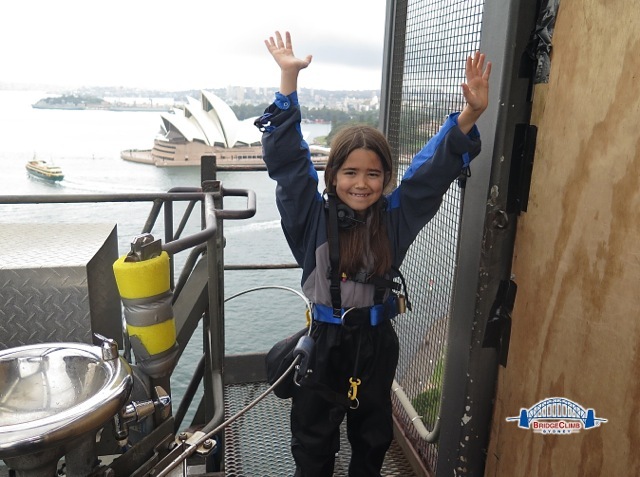 Mia on our climb to the summit of the Sydney Harbour Bridge! My family and I on one of the top sections of the bridge! We had to put our rain jackets they provided on at this point! A lovely view of the city behind us from the top of the bridge climb! 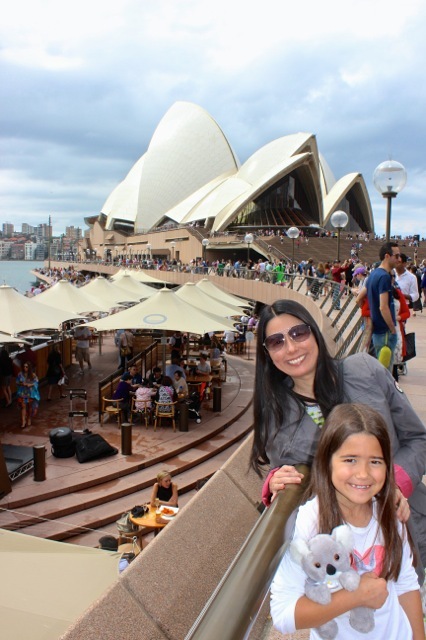 My family and I with the stunning Sydney Opera House in the background! 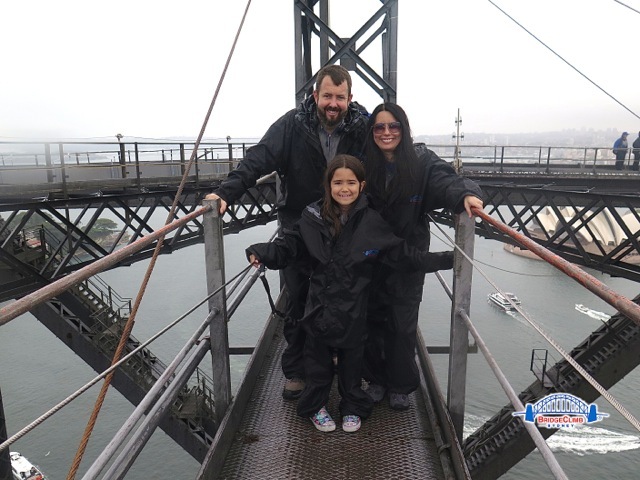 Luckily, it hadn’t started raining yet when we made it to this part of the bridge climb! 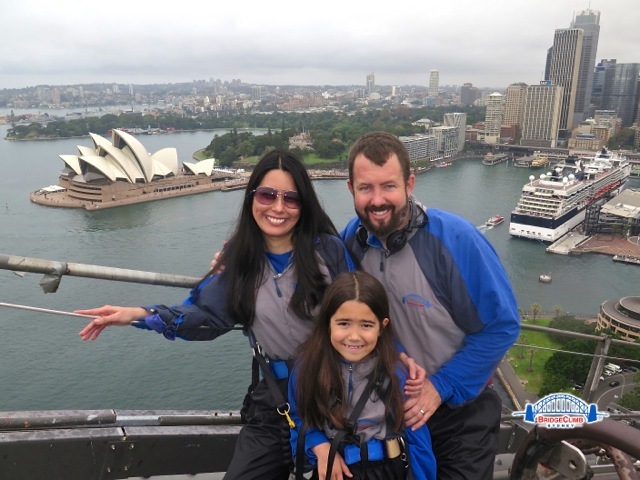 It was a bit scary at first, but seeing the view from the top of the bridge was definitely the top highlight from our visit to Sydney!